“A penny saved is a penny earned” ―so said the wise man. But when you have so many options to splurge on, saving may be the last of your priorities. However, some finance apps are hell bent to make saving not only easy but also engaging. In this 3-part series we are going to have a look at 3 of these finance apps. 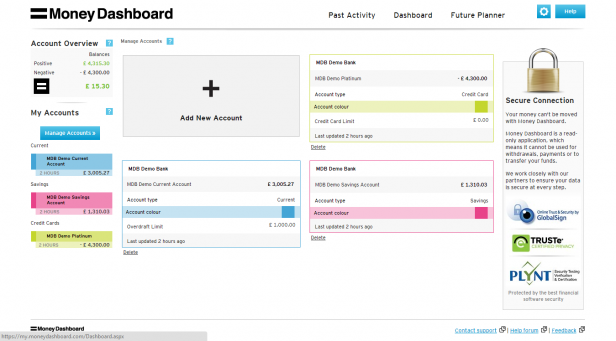 With their interactive dashboard interfaces, they are changing the way we look at personal finance management. The first in our series is— Money Dashboard. 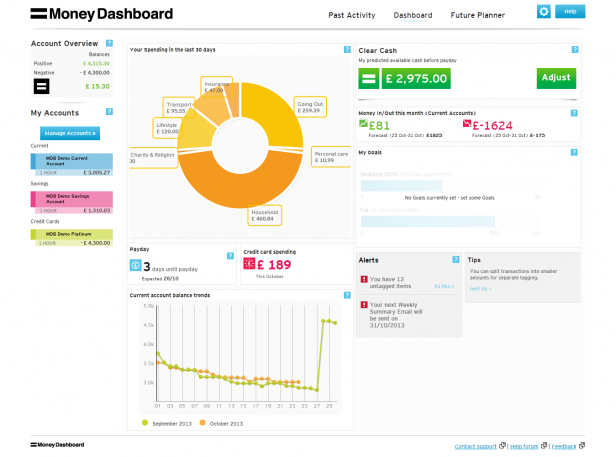 Money Dashboard is touted as Britain’s answer to Mint.com (the most popular personal finance management app in US). It is an online application that lets you monitor, organize and take control of your money. Once authorized, it can link to all your various bank accounts, provide real-time graphical analysis of your spending, allow you to set and achieve spending goals and also set alerts. It is however, a read-only application, you cannot do any monetary transaction using Money Dashboard. The Header has 3 main links—Past Activity, Dashboard and Future Planner along with Account Settings and Help. The labels used in the header are short and precise and use title-style capitalization (first letter of each word is capitalized) making them easier to read. However, the only indicator of a currently selected tab is a thin blue line as a highlight which is not a very strong visual cue for the user. There is also no visual connection between a selected tab and its respective content area. The left column remains constant across the app’s various pages and gives a quick snapshot of your linked accounts. Each section has a help icon, clicking on which an information box opens which shares some simple tips with the user. Good way to educate new users about the app’s functionalities. Clicking on Manage Accounts takes you to a new page where you can change the color used to represent that account, change login details of accounts, add new accounts and delete existing ones. This page also gives you information about when your account details were last updated. However, they should consider making ‘2 HOURS’ as ‘2 HOURS AGO’ across the app. Making things fool-proof sometimes helps! 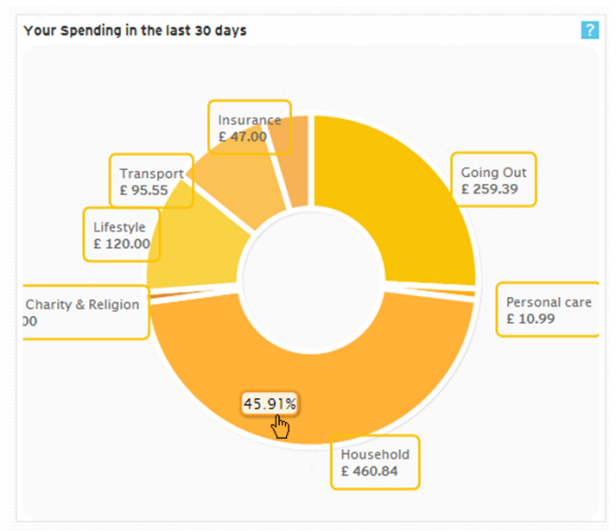 Using a doughnut chart, this section provides an overview of your spending across categories in the last 30 days both in amount as well as a percentage of total spending (in the tooltip). You can drill down into details of your spending in each category. Let’s say we click on Household. 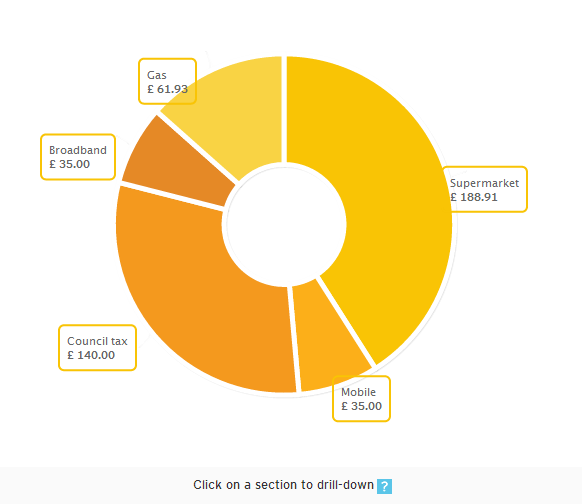 The first-level drill down shows you another doughnut chart with details of your household spending. This doughnut chart can be further drilled down. Let’s say we click on Supermarket. We get a popup showing the specific details of each of our Supermarket visits (date, name of superstore, amount spent, etc.). What draws your attention in this section are the big bold numbers—number of days to your payday and your credit card spending for the month. Both crucial figures but they generate opposite emotions in you. This has been brought out in the choice of colors and the icons used in their representation. This section compares the current account balances for each day of the on-going calendar month to the previous month using line charts. It helps you to understand the trend of your account balance. The details for each date can be seen in the tooltips. Clicking on this chart takes you to Past Activity > Balance History page. This chart helps in spotting trends in your balance history over a longer period of time. The checkboxes in My Accounts section (left column) helps you to select the accounts you want to analyze. At the bottom is a scrollable “mini-graph”. Using its sidebars and the bottom scrollbars, you can select the start date and length of the time period of your analysis. 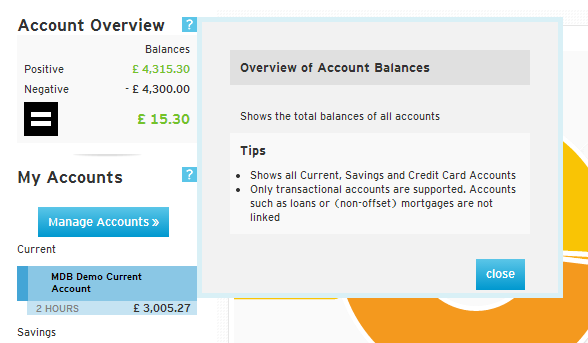 The Clear Cash section shows the amount of cash available in your Current Account(s) before payday, taking into account your budgeted outgoings and incomings. Simply put, it gives you an idea of the money available at your disposal and helps you to know if you can still afford that exotic beach vacation with your spouse. The Adjust button takes you to the Future Planner > Budget Tracker section. A process of gradual reveal is followed in this page. At first, you get to see only broad figures of Money In and Money Out. As you click on the arrows more data is revealed. This reduces the cognitive load on the user. More data is revealed only when the user shows interest (through a click). 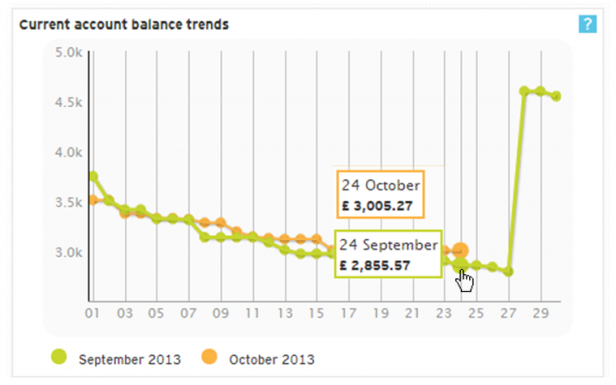 This section shows actual and predicted income and expense of the month. The big bold numbers along with the upward and downward moving graph icons clearly indicate what each value represents . The predicted values are indicated in black using a smaller font size. Proper prioritization of data is crucial in dashboard design and here it is achieved quite well. This section allows you to set goals and uses a progress bar to indicate where you stand in terms of buying that SUV. Though Alerts occupy an important position in most personal finance dashboard layouts (eg: Mint where it comes at the top), in Money Dashboard it occupies the position of least importance (bottom right). Due to its position and its background color (grey), it somehow gets lost in the whole scheme of things. Help tips are there throughout the app and are very useful for both new users getting used to the app and old users trying to explore some new features. Overall, the Money Dashboard does a good job in helping users manage their personal finance by giving them a quick snapshot view of their income, expense, budget, etc. and providing them a platform for further analysis. The use of interactive charts makes the app further more engaging. However, they do need to improve on certain fronts. Their export feature is limited and currently allows the export of transaction details only. Their recently introduced weekly Financial Summary Email, which provides users with a snapshot of their finances over the previous 7 days, somehow tries to make up for it. They need to make their design more responsive for their on-the-move users (It seems they are already working on it.) Some minor design changes in the header (like a stronger visual cue for a selected tab and linking the selected tab to its respective content area) and some more thoughts on the overall information flow (like Alerts should be placed at a more important position) and this app could easily be counted amongst the best money management apps. Acknowledgement: Thanks to the Money Dashboard team for providing us with a demo account for this review. 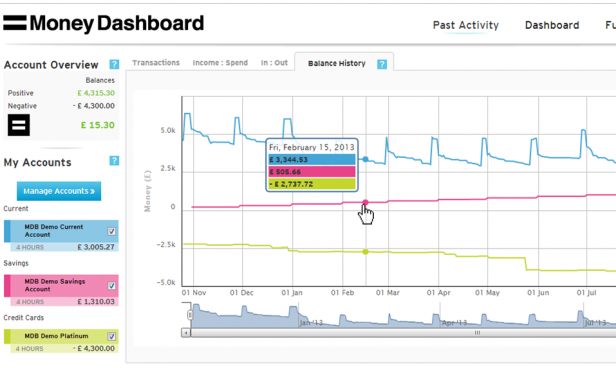 Next in the series: Toshl.com, an amazing finance dashboard with multi-platform compatibility.